Oud-Zuid (a prime area) is the district with the highest average value homes in Amsterdam. It also has the most houses—48,000 residences for 83,000 residents. More than half of these are native Dutch. Oud-Zuid is a posh district, with shopping streets (PC Hooftstraat, Beethovenstraat and Cornelis Schuytstraat) lined with luxury stores and boutiques selling big brand-name clothing and jewellery. There’s the aptly named Museumkwartier, where you can visit the Stedelijk Museum, the Van Gogh Museum, and the Rijksmuseum Amsterdam. The Museumkwartier is also the site of festivals, demonstrations and other mass gatherings. It has an underground car park and an underground supermarket near the Singelgracht canal, on the banks of which are hotels and a casino. From the Museumkwartier you can make your way to the Vondelpark, the largest and most popular park in the city. Designed in the style of a sprawling English garden, the park’s 47 hectares of greenery contain a playground, a film museum, a free open-air theatre, a sports field, tennis courts, bike paths, and wide open areas perfect for picnics, music concerts, kite-flying and roller-skating. It even contains ponds and long pools in the Dutch style. In the centre of the park, visitors can relax and have a cup of tea or coffee at the Het Blauwe Theehuis. The neighbourhood of De Pijp, so named for its narrow, straight and pipe-like streets, is the home of the Albert Cuypmarkt, which has a mile’s worth of stalls, and many cafés, bars and restaurants that feature food and drinks from all over the world, but especially from Suriname, Morocco and Turkey, which have provided the Netherlands with most of its non-native Dutch citizens. A significant percentage of the population are immigrants, and the place is popular with tourists and students. De Pijp is one of the liveliest and most cosmopolitan places in the Netherlands. Contributing to the beauty of the area are the Oranjekerk and Vredeskerk churches and the Afrikahuis, which welcomes African visitors and Dutch of African origin. 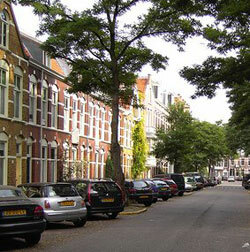 De Pijp still houses a large number of students and artists, but the population is gradually changing. House prices and rental rates have been going up, due to the area’s popularity.